The Clinton First Aid & Rescue Squad is always in need of volunteers. As a volunteer member of the squad you will be provided with all necessary training and equipment at no cost to you. If you are interested in becoming a volunteer follow the link below to learn more. 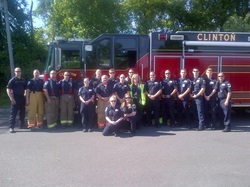 Clinton First Aid & Rescue from Brandon Murphy on Vimeo. Every 15 Minutes program, produced by North Hunterdon High School students on May 31, 2016. CFARS had the privilege to participate in this bi-annual event.